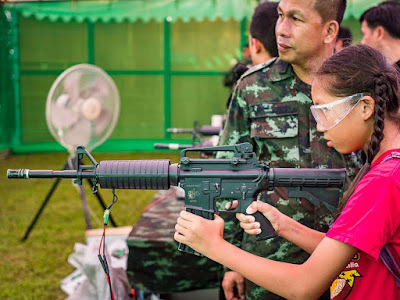 A boy plays with TAR21 assault rifle during Children's Day activities in Bangkok. 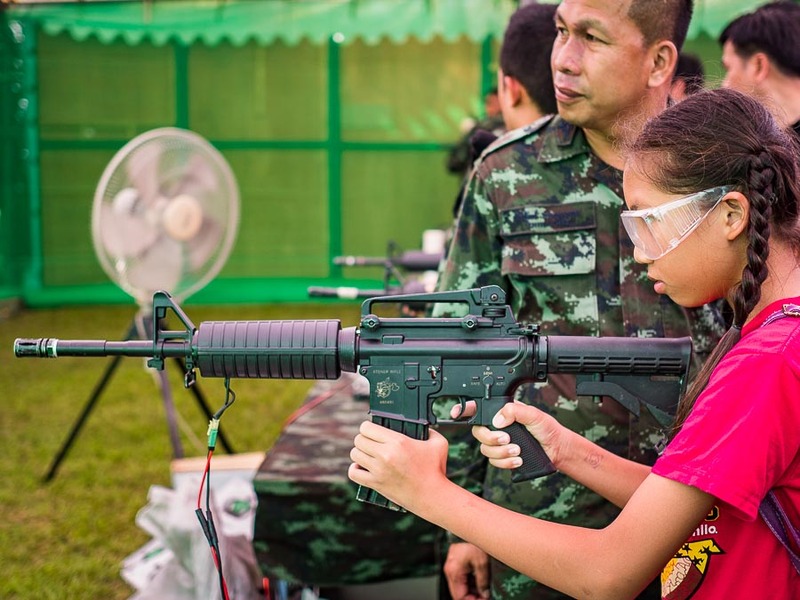 The Royal Thai Army hosts a popular Children's Day event at the 2nd Cavalry Division headquarters. The second Saturday of the year is Children's Day in Thailand. Government offices hold open house type events so the kids can see what goes on in government, malls throw parties for the kids and parks sponsor big events. But all that pales compared to what the Thai military does. Military bases throughout the country open and host events. The latest military hardware is on display, from little things like assault rifles, to big things like tanks and jet fighters. The kids are given the chance to play with and on most of the military hardware. 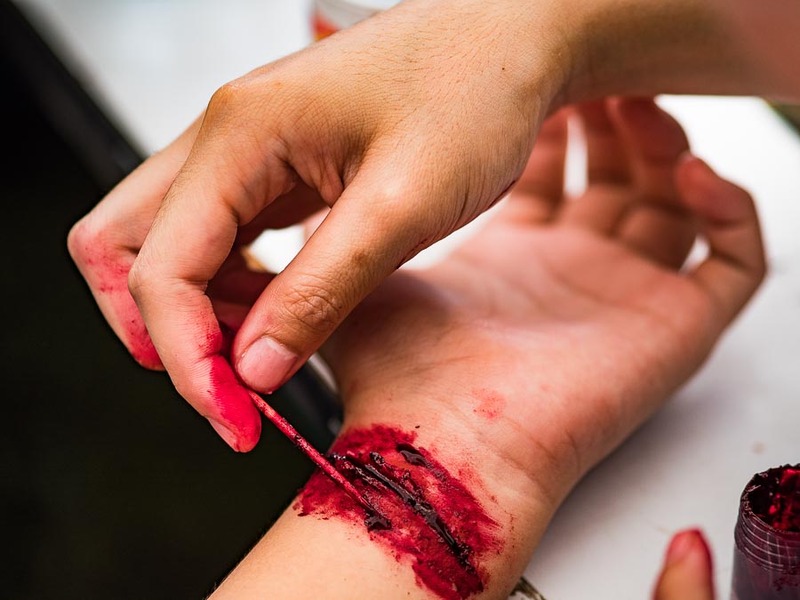 Military medical personnel use theatrical makeup to paint faux battlefield injuries on the kids. Although this looks more like a cry for help than a battlefield injury. Children's Day has been celebrated in this overtly militaristic way for years - way before the 2014 coup that deposed the elected civilian government. 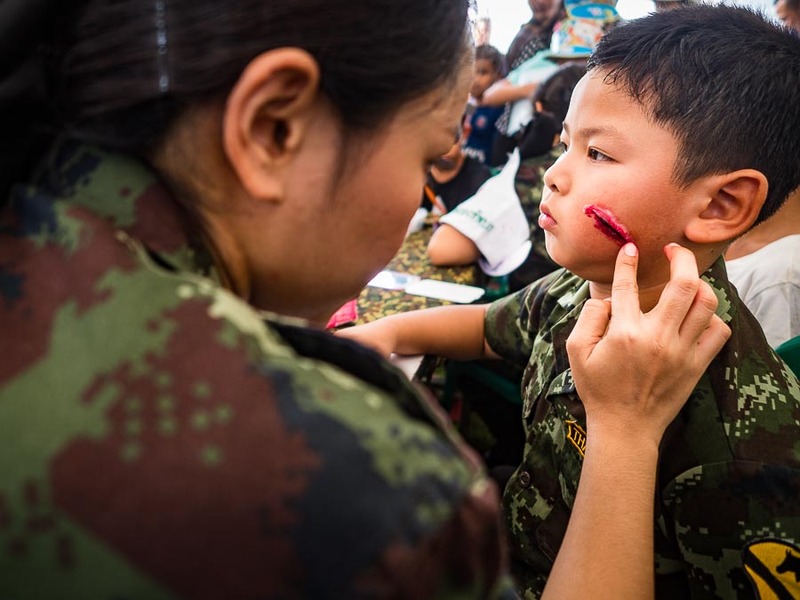 The military is deeply woven into Thai society. They control banks and industries and the generals are important members of society. They're seen by many as the ultimate protectors of the Kingdom's values and culture. When an oilspill fouled the beaches of Koh Samet in 2013, a lot of the manpower for the cleanup was provided by the Thai Navy (although the cleanup was supervised by oil industry experts). When there are floods, the military leads relief efforts. During the drought of the last two years, it was the army who prevented farmers from stealing water but they also drilled boreholes, dug wells, built reservoirs, and hauled water to rural communities. In the US, people may go years without interacting with an on duty member of the military. In Thailand people interact with the military every week. Soldiers supervise a firing line of AirSoft type BB guns. In the last couple of years, a few writers in Thai media have been critical of the militaristic celebration of Children's Day but, at least the 2nd Division Army base, crowds are still huge and enthusiastic. One of the displays included a demonstration of the use gas masks. 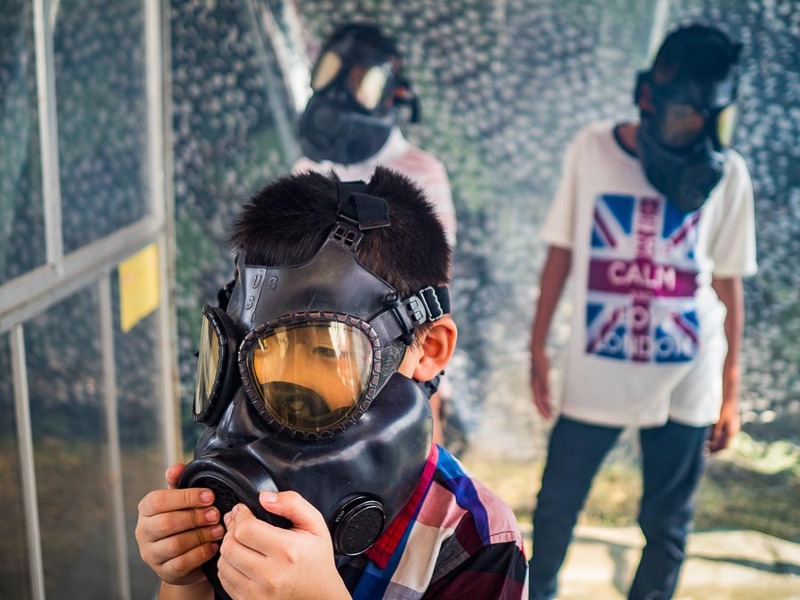 Kids put the masks on and stopped into a sealed room that was filled with fog (from a dry ice fogger). As the kids left the room a soldier gave them packets of instant Mama Noodles, Thai style ramen noodles. I was a little taken aback by the overt militarization of Children's Day the first time I covered it. 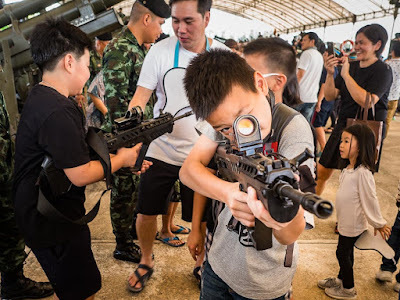 After years of covering Children's Day though, and photographing the Thai military involved in daily life here, I try not to read too much into it. There are more photos of Children's Day in my archive.